Hell is about to come to earth. Doom Eternal is set for a gameplay reveal in less than an hour as part of the QuakeCon keynote address. Specifically, it begins at 9:00 PDT / 12:00 EDT / 17:00 BST. Which is, uh, soon. You can scroll down for an embed of the QuakeCon stream below and catch the action directly. We don’t know exactly how much Doom Eternal we’re going to see, but you can bet it’ll be a more substantial look than the teaser trailer we got back at E3. The keynote also promises “an expanded look at Rage 2 gameplay” in addition to “breaking news for Quake Champions and other titles.” What those other titles will be remains to be seen, but it’s fair to guess Fallout 76 will be one of them. Despite the lack of a number in its title, Doom Eternal is the proper next game in the series developed by id Software, and is the full sequel to 2016’s Doom. 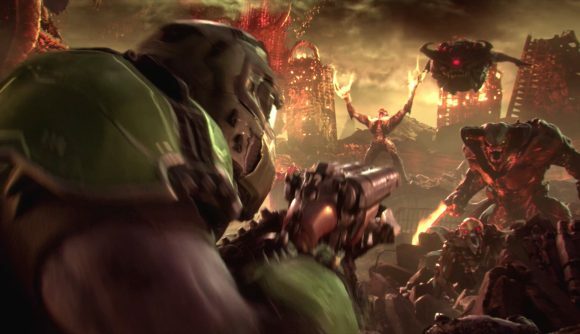 E3’s reveal trailer showed that the forces of Hell had spread to Earth and the Doom Slayer marine is back to kill them all, because he’s nice like that. New monsters include the fire spell-throwing Arch-Vile, the mini-spider mastermind Arachnotron, the skull-spitting Pain Elemental, and some weird worm things. The Arachnotron hasn’t actually been seen in the series since the Nintendo 64-exclusive Doom 64 in 1997. Id Software are focusing all their efforts on Doom Eternal since Rage 2 is mostly being handled by Just Cause developer Avalanche. At the moment we don’t know how much of the game will be shown off at QuakeCon, but given the large marketing push we’re expecting something more significant than a single gameplay trailer. Keep your eyes peeled for that Doom Eternal release date – we might just get one today.